In the course of preparing this year’s Open Source CMS Market Share Report, I’ve spent a fair amount of time researching Twitter as a means of judging buzz and popularity. As a result of that I have bookmarked quite a few tools that I found useful. In this post I share what I’ve found — perhaps it will save you some time. Please feel free to add to this list using the comment form at the bottom of the post. The message data contained at Twitter.com can be analyzed directly through either search of the Tweets or by looking at the use of hashtags, that is, tags users have associated with particular Tweets. You should be aware of the default Twitter search functionality, as it does show basic trending information, but more importantly, you can tailor your searches to extract trend data by using either the advanced search interface or the Twitter Search Operators in your queries. While this may not produce the prettiest charts and graphs, the tools allows you to search by date, user, location, sentiment and other variables, thereby giving you the best control over the raw data set — direct from the source, as it were. The results display allows you to filter by language. Use the RSS feed to save your query and keep up with the Tweets as they occur. One disappointing aspect of this tool: it lacks result counts, export, and charting of the result set. This site accumulates a directory of hashtags and lets you search for particular tags and track their activity for the previous 30 days. The default homepage allows you to view the most popular hashtags for the past day, week or month. One handy option allows you to get an RSS feed for a hashtag. Want to find out what’s buzzing in a particular place? Geo-tracking of Twitter users is one way to do it. Geo-location filtering for Tweets. Want to find out every Tweet coming from within 100 miles of New York City or Paris or Hong Kong? You can do it here. This application is more distraction than serious research but it is most certainly good fun. It takes Tweets and maps them on the world map as they happen. When you have to know what’s happening across the Twitter-verse as it happens. When one user retweets a message from another user, the message is assumed to have some special value — at least to the user that retweeted it. When a message is retweeted many times by many users, you have a trend worthy of further examination. Find out who and/or what is being re-tweeted now. This is a limited tool that shows you a tag cloud related to the most popular topics on Twitter, judged by what is being retweeted. An archive lets you view the most recent days’ activity. There is a wide selection of tools for tracking what’s hot — both in terms of topics and URLs. This site aggregates news, photos and other current events type data from Tweets. Stories are categorized by region and topic. It is searchable and you can extract the data into an RSS feed. A finger on the pulse of the Twitter masses. TweetingTrends tracks top Twitter trends and then uses Twitter to deliver the results. Follow their Twitter account to receive notifications via Twitter each time a new topic trending on Twitter enters the top 10. Tracks the top URLs being discussed on Twitter. This is perhaps the most complete of the various URL tracking services. It goes so far as to organize popular topics into channels and presents the information in a variety of ways — including for those who want to grab a hold of the information firehose — a live Tweet stream. The system supports searching as well. Tweetmeme maintains a large number of different Twitter accounts, enabling you to follow particular channels for the most popular stories. This cool one page website enables you to type in a word, phrase, URL or hashtag and get a snapshot of the reach of that term or phrase. It does this by finding all mentions, then reporting back to you the sources and the reach achieved by that user when they post a message. The system calculates total viewers and views. The tool is useful and interesting, but to get the most from it you will need to use the Twitter Search Operators in your query. Unfortunately there are significant limitations to the tool. The free version is limited to only 50 tweets. You can, for a fee of US$ 20, order a more complete report listing up to 1500 tweets across the last 7 days. Twist lets you track trends in Twitter mentions on a daily, weekly or monthly basis. Output is provided in graphical form, as shown below, along with a list of the most recent items. Charts can be embedded in your local website. > above: Twist stats showing activity for search terms across 30 days. This site requires you to log in with your Twitter I.D. Once you have logged in you can monitor trends by tag cloud, or by searching for trends. The options allow you to graph activity on one or more topics by last 6 hours, 1 day or 3 day increments, as shown below. > above: Part of the Twitscoop display. This basic tool displays the Top Twitter Trends by day, week, or in near real time. You also have the option to enter the term of your choice to see Tweets in real time. Another URL popularity tool, this time showing the most popular URLs of the moment. What distinguishes this tool is that it also displays thumbnails of the most popular pictures and videos. Tracks most popular URLs on Twitter. Shows by default a list of the top URLs, but you can also search for the terms or URLs you wish to track. They maintain a Twitter site that automatically displays the current top 3 most popular URLs. Several tools allow you to assess the reach and influence of particular users. You can also gain insight into their interests and various activity levels. A great way to run numbers of Twitter user influence. Use the tool to graph Twitter activity by user name. Enter the Twitter username and the system will graph a wide variety about the user’s Twitter posting activity. Stats include, frequency, time, retweets, tool used, and aggregate daily and weekly totals. Graph output quality, as seen below, is also a step above many of the other tools on this list. Note if the user has protected their updates, the tool will not work — the user’s Tweets must be publicly accessible. > above: Some of the many graphs produced by TweetStats. By default this search tool shows you what’s hot right now, but the best feature here is the ability to run a search and get results displayed both by the authority of the poster and by most recent. Great way to find out who is talking about a topic. They also maintain a Twitter account that automatically Tweets the most popular trends. Twitter Analyzer claims to be “the most advanced Twitter analytic system in the world.” While it is certainly powerful and slick (see below), it is focused purely on users, rather than on topics, trends, etc. Great if you are looking to assess a user’s influence, or want to find out more about a particular user’s Twitter usage patterns. > above: Part of the Twitter Analyzer’s user profile dashboard. 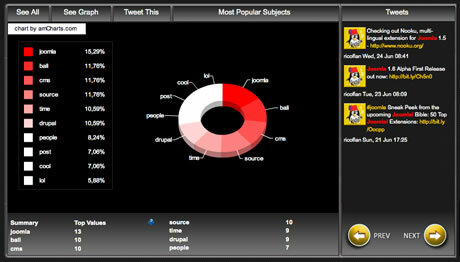 Xefer is a Twitter activity monitor. Enter a user’s Twitter ID and the system produces a nice little heat map (see below, of the user’s historical activity. The output will also list the user’s replies, with a list of to whom they were directed and the frequency. Note if the user has protected their updates, the tool will not work — the user’s Tweets must be publicly accessible. > above: xefer profile of a Twitter user.